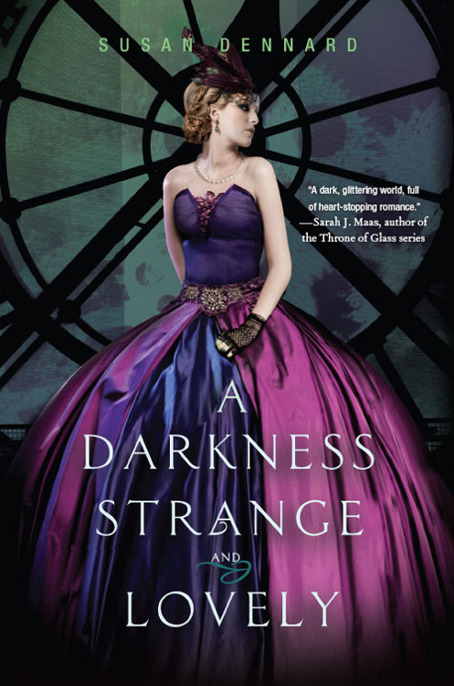 READ A Darkness Strange and Lovely FREE online full book. For Sara Kendall and Joanna Volpe—you believed in me from the start, and I can never thank you enough. was so elated I forgot I had no hand. “Oh, thank heavens!” I cried, reaching for the battered envelope in the postman’s grasp. “I’ve been waiting for this for over a . . .” I trailed off. My eyes locked on the postman’s horrified face—and his eyes locked on my wrist. Yet it was not the poor quality of my gray gown’s lace sleeve that prompted his expression but rather the bandaged stump poking out from beneath. I yanked back my wrist, and the postman’s face erupted in red. “P-pardon me, Miss.” He thrust the letter at me. “Of course,” I squeaked, snatching the letter with my left hand. Then I bolted from the post office into the Philadelphia morning. Holding the hard-earned letter like a visor against the sun, I strode into the bustling Chestnut Avenue traffic. The road’s cobbles were layered in a sticky, dried mud from yesterday’s rain. It clung to my boot heels as I crossed into the rattling carriages, clopping horses, and distracted pedestrians. I would remember. The empty wrist ached all the time—itching in the night as if my fingers were still attached, reminding me constantly of how much more than a hand I’d lost. If not for that wretched injury, maybe I could put all the summer’s horrors behind me. Maybe I could push through each day instead of barely keeping my head above the darkness. It always hovered there, threatening to drown me in memories of Elijah . . . and Clarence . . . and Mama. . . . But it was not to be. Just as my hand would never return, this grief would never leave. Life—and death—did not work that way. actually seeing the ghostly remnants of my hand. As my brother, Elijah, had told me, if he had necromantic powers, then whether I wanted them or not, I did too. I dabbed at my brow with my sleeve. Summer might have been fading into fall, and the thunderstorms with it, yet the heat seemed determined to stay. The usual breeze carried from the Delaware River was missing, and I wished—not for the first time—that I hadn’t left my parasol at home. The annoyance of holding it in my clumsy left hand was nothing compared to the sweat oozing down my back and beneath my bonnet. Paris! I hadn’t heard from Jie in more than a month, and the Spirit-Hunters had been in Chicago then. I’d hounded the post office every day since, desperate for some message that would tell me where they were—in hopes that I could join them—but no word had come. Until today. I scampered out of a buggy’s path and onto the opposite walkway, where I found the welcome shade of a storefront. It was Mrs. Binder’s trimmings store, where Mama and I had once bought sewing supplies. With no concern for propriety, I clasped the envelope in my teeth and used my left hand to rip it open. , as they call them) and then the next minute they’re sipping their champagne and laughing at the latest scandal. Daniel calls them mercurial. I call them annoying. I snorted. I could just imagine Jie’s scowl as she declared the Parisians all manner of undeserved foul things. But it’s not just the Parisians who are strange. The Dead are bizarre too. Not only are they walking corpses, but they’re recently dead. Murdered. Joseph thinks it’s some sort of sacrifice, but he can’t tell what exactly. He spends all the moments he’s not out fighting the Dead or speaking before the Sénat with his nose stuck in a book. Our host, the Marquis du Bazillac, is generous enough, but he’s demanding too. He seems to want Joseph and Daniel everywhere so he can show them off like prize cows. Daniel just saw me write that, and he’s telling me to scratch it out. I told him I’d scratch out his eyes if he didn’t go away. With a tight swallow, I kept reading. You should see Daniel these days—you wouldn’t recognize him. He’s got this book on manners he carries with him everywhere; and not only does he always wear a suit now, but he’s got a top hat to boot! Prize cow, indeed. I hope you’re well, Eleanor, and I wish you were here with us. I know your mother still needs you, though. Is she doing any better? Is she still at the asylum? And how is your hand feeling? Well, that’s enough questions for one letter. Besides, Daniel wants to add something, and I’m almost out of space. Write me back and send it to the Hotel Le Meurice in Paris. Stay out of trouble. I can’t rescue you from across an ocean. But it was too late. The regret trampled over me, aching in my throat. He had told me he didn’t love me months ago; and yet at every note he added to Jie’s letters, I inevitably turned into a pathetic ninny. Why was it that no matter how many times I scolded myself for caring, none of my stupid feelings would fade? Although . . . I stiffened. I knew that shrill voice—just as I knew the huskier one that followed. Wincing, I stuffed the letter into my pocket and hid my bandaged wrist in the folds of my skirts. Then I turned to face Mercy and Patience Cook—or the Virtue Sisters, as I preferred to call them. Squat Mercy bustled over to me, beaming in her lavender gown, while lanky Patience, pucker-lipped and pink clad, ambled behind. “Oh yes!” Patience said. “We had heard that.” Her nostrils fluttered as if she smelled a particularly good piece of gossip, and I knew immediately what question would come next. “Is she still at Kirkbride’s? Is she still . . .
, her mind had cracked. Mama’s health was the only reason I hadn’t chased after the Spirit-Hunters the minute my wrist had healed enough to travel. Kirkbride’s was lovely, what with its progressive ideas on mental health and its beautifully flowered grounds; but it was also expensive. Patience for forcing me to. Fortunately, Mercy clapped her hands just as I opened my mouth to sputter something utterly inappropriate. “Oh, we were just in Mrs. Binder’s, Eleanor, and we saw the most wonderful pistachio muslin! Didn’t we, Patience?” She poked her sister. I grunted, unable to conjure any other response. As far as I could tell, there was absolutely nothing wrong with their current gowns. I was in the same gray walking gown I’d worn every day since June, and it was still perfectly functional.
. And Mercy’s lavender grenadine was easily worth seventy-five. After selling all of my own dresses to pay for Mama’s hospital bills, I’d become quite adept at estimating what a dress would fetch at Mr. Rickard’s Pawn Shop. I was also quite good at haggling for the best price. However, I was not particularly adept at controlling my facial expressions. I quickly schooled my face into a smile, but as my lips parted to reply, Patience cut in. she ask about Allison Wilcox when she knew perfectly well what had passed between our families. wouldn’t have seen Allison,” she cooed. “Not after your . . . ah . . . how to phrase it delicately? “Patience, stop that!” Mercy hissed. “Enough!” Mercy dug her fingers in Patience’s arm and yanked her away. She flashed me an apologetic grimace. “I’m so sorry, Eleanor. I hope your mother gets better.” Then, without another word, she hauled her sister into the busy street and disappeared from view. I was rendered speechless. I couldn’t even breathe. Tears I had fought every second of every day now rose in my eyes like a tidal wave. I stumbled back until I hit Mrs. Binder’s window. “You are better than she,” I whispered to myself, blinking the tears away. “Stronger and better.” If I could face an army of Dead, then the insults of Patience Cook should be nothing. But they weren’t nothing—not when they echoed with so much truth. So I did as I always did: I forced my mind to dwell on other things. Normal, day-to-day things. Spinning around, I stared into the shop’s window. My eyes lit on a frilly parasol in the display’s corner. And the tears came boiling back with such a vengeance, I couldn’t contain them. All I could do was keep my face hidden and let them drop. a good place. I knew that now, and no amount of distraction would let me forget. As soon as I was in control of my emotions once more, I went to the bank to deposit my latest funds from Mr. Rickard. It was a small sum on which to manage living. I had stopped paying Mary, my mother’s maid, long ago; and though I wasn’t sure why she stayed with me—pity, friendship, or (most likely) guilt—I was grateful for the company all the same. My childhood home, emptied of furniture and devoid of life, would have been too much for me to bear on my own. It was just as I strode between two columns and onto the marble steps leading down to the street that my right hand—no, the empty space where my hand had once been—began to tingle. I glanced down, certain I’d see a shimmer of starlight, like a little wrinkle in the world where my hand used to be. But nothing was there. Just the usual cloth bandages . . .
spirit was jangling at my senses. Holding my breath, I whirled around to scan the crowded street. Simply because I knew I could sense the Dead didn’t mean I was used to it. And it certainly didn’t mean I enjoyed it. My eyes raked over traffic and across building fronts, but I saw no unusual shimmer or flash of blue. I gulped, my throat tight. Why wasn’t this throbbing going away? If nothing Dead was here, then . . . Pain stabbed through my right arm, sharp and burning. A cry broke from my lips, and I yanked my arm to my chest. my missing fingers. They shifted from static blue to solid pink and back again. A screaming howl filled my ears. I whipped up my head, my heart lurching into my mouth. But when I scanned the area for some rabid hound, all I saw was the usual clattering carriages and purposeful walkers. The tobacco store across the street, the saloon next door—they all looked the same. Not a dog in sight. The cab drivers trotted by, their horses ambled on, and everyone continued as if they heard nothing. Cursed be the Wicked by Richardson, J.R.